Emeril Lagasse began his cooking career in New Orleans. 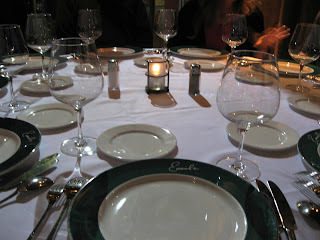 His signature restaurant, Emeril's, was his very first restaurant. 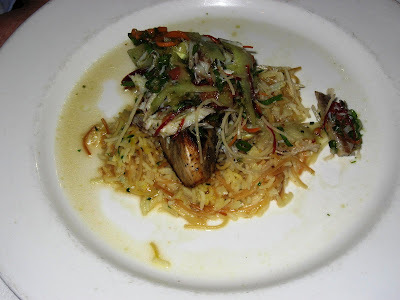 Located in the business district, but within walking distance from Canal Street and the Marriott hotel, this restaurant has a nice, old-world charm. Soaring ceiling, exposed brick walls, wrought-iron accessories and antique lighting fixtures add to the mood. 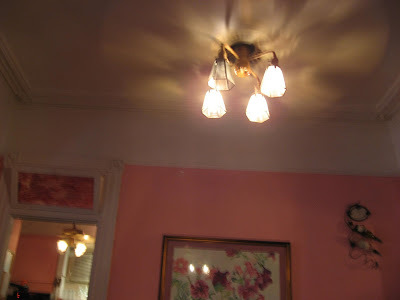 We had made reservations and they had a table ready for us, right next to the window from which a street lamp flooded us with light. We ordered a New Zealand Pinor Noir and perused the menu. 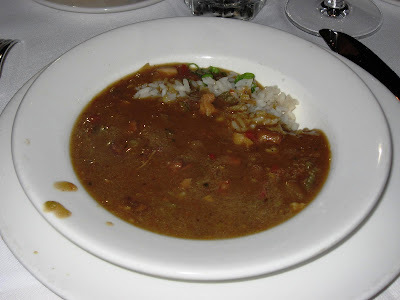 I decided to try a traditional Gumbo; this dish is a thick, spicy stew made of vegetables, meat and boiled rice. The Gumbo of the day was made with Andouille saugages and chicken, and poured out of a ordinary aluminium pan for that authentic touch. My entree was a Dusted Jumbo Gulf Shrimp with brown butter, sweet potato Grits, beans, Benton’s Bacon, smoked corn and mango chow chow. 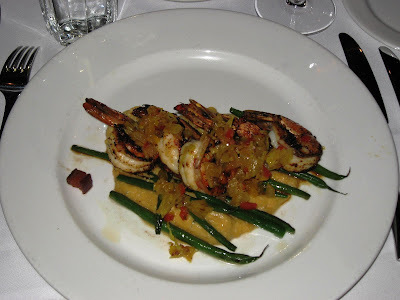 The shrimps encrusted with the bacon strips was overall was a very interesting dish. Those who selected the bacon-encrusted Redfish, the Grilled Swordfish, and the Pan-roasted Rainbow Trout were happy with their choices too. What I will remember most was the out-of-the-world Sweet Potato Cheesecake I ordered for dessert. The cheesecake was amazingly good and I have not had anything like it before. There was a cool wind blowing from the river, making the walk back pleasant in the humid evening. The mighty Mississippi river curves through the city very close from here and one can clearly hear the horns of the boats at night. 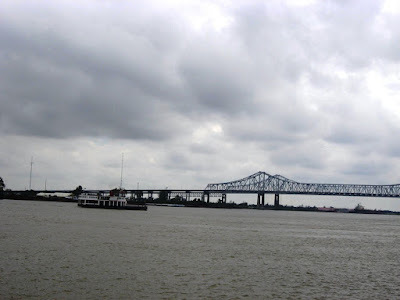 The port of New Orleans is the busiest one in the USA and more than 600o vessels move through it on the Mississippi every year. The next day, I wasn't too hungry and decided to have a late morning brunch. 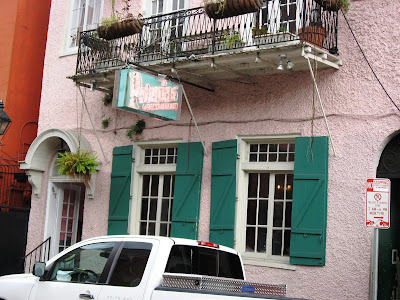 The concierge had recommended Petunia's, which some say is the best place to eat breakfast in the French Quarters. This restaurant off Bourbon Street looks completely unremarkable but has history. 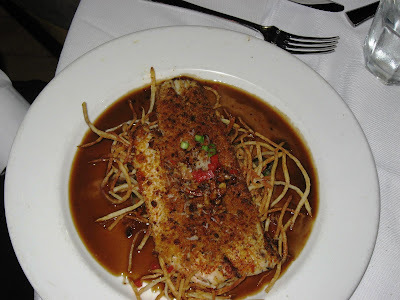 Petunia's is housed in a 3-story Creole townhouse erected in the 1830's by a noted cabinetmaker of the time. The interior is especially fascinating for his mastery of intricate details of the all cypress millwork including the mantels surrounding the original coal-burning fireplaces. Behind the main building is a two-story dependency, separate from the main building, frequently referred to as a slave quarter in which the cooking for the family was done. Initially called the St. Louis Street Crepe Shoppe, the name was changed to Petunia's in the 80s, when a full-service menu was added which features Cajun and Creole dishes and other New Orleans favorites. 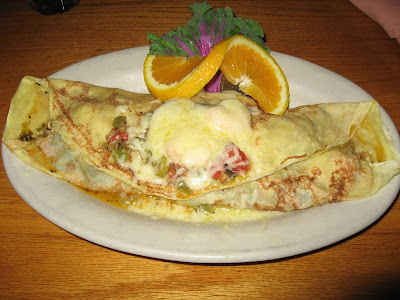 I ordered one of their famous crepes, the St. Francis, stuffed with shrimp, Louisiana crabmeat, ratatouille, and cheese sauce. They claim their crepes are the largest in the world, and the size was indeed daunting. They also have some great dessert crepes, but be forewarned - everything here comes in really large portions! Bourbon Street was quiet during the afternoon as I walked back. There were a couple of good galleries selling local art and I bought a couple of them. The French Quarter of today is the old city, which was built by the French in the early 18th century. Bourbon Street was named at that time and continues unchanged. The French also brought in Mardi Gras and African slaves into America at that time-period. During the four decades of Spanish rule, this city got olive oil cooking and the elegant wrought-iron balconies. 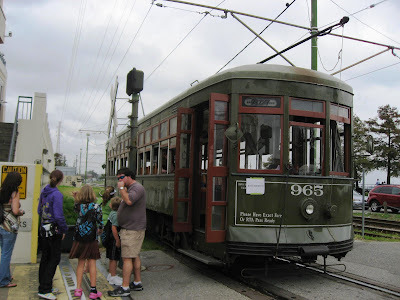 The streetcars here (single car, unlike the ones in Calcutta which have two cars) are another quaint sight you can see even today. 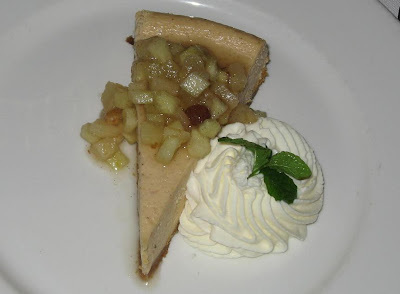 Sweet potato cheese cake sounds quite exotic..
french quarter looks charming. i just love the ethnic neighbourhoods or quarters with colonial legacy. @vikash: Oh yes, the size of that crepe was huge! @lakshmi: I didn't know what to expect, but the cake was amazing! @harekrishnaji: Wish you a Very Happy Diwali too. Awwww, you know I love all kinds of seafood and this post was a real interesting read since the way they preserve and serving it is very different from recipes in Norway. 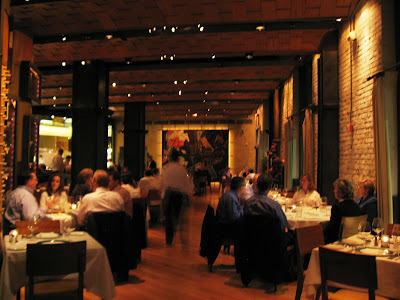 It looks like a very nice place to eat - so sophisticated - thanks for sharing! @RennyBA: I do have to visit Norway sometime soon, or at least find a place where I can taste the cuisine. I am intrigued by the descriptions from your blog - pickled and preserved fish.